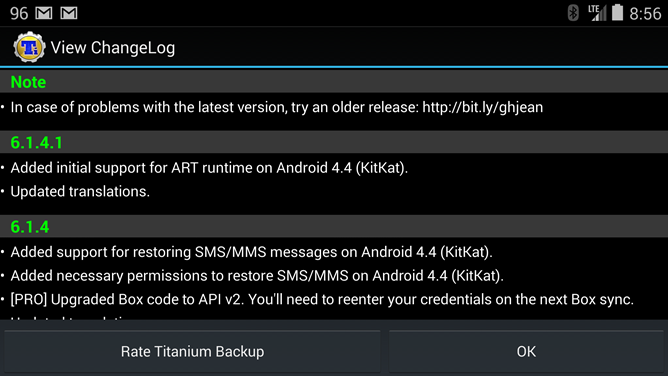 For a lot of users, Titanium Backup is one of the first Android apps they install on a new device or ROM. So it's no surprise that a few of them were dismayed when they tried to do so on the Nexus 5 (or one of a growing number of updated Android 4.4 devices) with the fancy new Android Runtime enabled, and found that Titanium would crash. The developer has updated the app to 6.1.4.1 in short order, and it should now run in both ART and Dalvik. If you haven't heard, ART is a new way for Android to run apps and cut down on compiler overhead, making them faster and more efficient. Unfortunately the process means that plenty of apps will need to be adjusted to be compatible with the new experimental runtime. For more information on ART and its benefits and drawbacks, check out our comprehensive introduction post. If you haven't messed with ART thus far, you've got nothing to worry about - the update to the Titanium Backup app won't affect you, though the developer has also updated the translations. If you are on ART, you should now have access to Titanium's myriad features once again. If you're planning on flashing in preparation for a custom ROM, be aware that the common Gapps packages have not been made ART-compatible yet, so you might want to stick to official OTA builds for now.